@rsummers Good news, after tweeking and tweeking the slicer settings and the settings on the printer, I finally got a decent print. I further leveled the bed height and the magic trick seemed to be when I increased the output to 165. I'm now experiencing what appear to be regular print problems that I am sure most of you all have dealt with and I'll just have to work my way through them. Hey @KELVIC-3D We do have this on our To-Do list here but it is something that will take us just a little bit of time to test. For the moment you might be able to get away with using the CR10 profile and changing the bed size in the printer tab. Working on a run of NylonG parts I have had no issues with skin irritation when handling the printed parts. Hey @Nmicciola Thanks for posting up here and hanging out. It looks like you have an idea in that the gantry is at fault but you are approaching the situation all wrong. First off, we do not ever use a Bubble Level to level out a printer. The reason for this is that we are actually trammeling the print head to the bed of the printer. This is basically a reference of the nozzle being level to the bed. What you have measured is the gantry of the print head being level to the ground (gravity) and the bed, in this case, may still be out of level even if you did account for the offset. So what you need to do for this printer is actually tighten the screws on the left side of the gantry so that the cantilever side does not droop as much when the print head moves across. Using an auto bed leveling system will help as well but it will not resolve the root cause in this case. @michael-petitclerc They don't fluctuate at all. 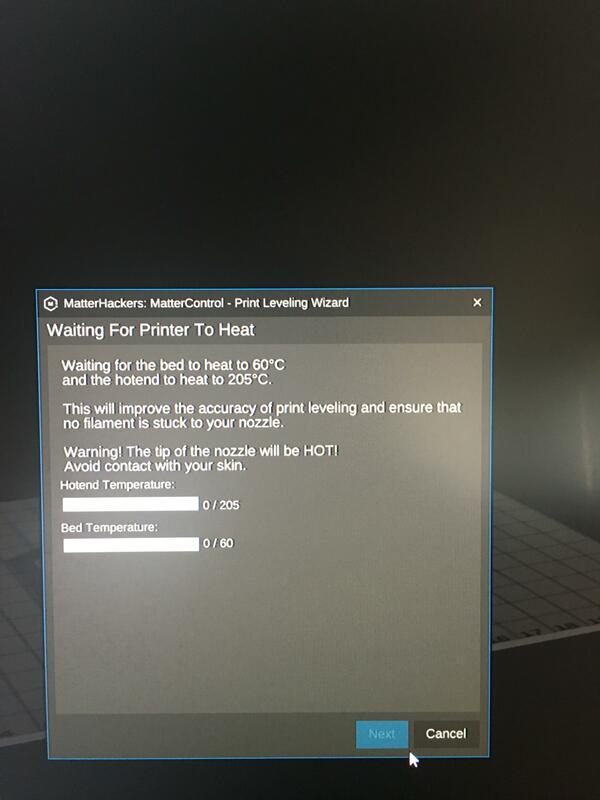 During the printer setup it says things like "Congratulations on connecting to your printer" then it shows what the overview will consist of the it says "Wait for the bed to heat to 60 degrees C." Then it doesn't do anything else thereafter. It sits like this with the same numbers, nothing on my printer happening either. Hey @easydog You will find the setting you are looking for in the "Printer" tab. If you have not enabled the printer tab you may not see it, you can find it in the top right in the three dots just below your user name. Weird grey/black plastic balls on my blue print? Hey @TheJasonPlayz It sounds like you might have some of the PLA burning up in the nozzle and/or on the surface of the nozzle. This can sometimes be caused by over extrusion or impurities in the material burning up. I have seen this a lot in Zortrax Z-ABS when using the colors Yellow, White, Blue, and Green. If I remember correctly it was just the color filler burning up at the temps they had set but this was a specific thing to Zortrax and their material. What PLA are you running and how hot are we running on it? Where can I find the extruder spring? I use 60 on the bed and 195 for the extruder, with no problems with delamination . It seems to me, that you need to lower the nozzle closer to the bed, use the baby steps. I always have 4 layers so when the print starts it give me time to make adjustments.